Designing Forms or Reports can be learned quickly by mastering the usage of Design Tools available in MS-Access, keeping aside the programming aspects. But, data processing is something that demands diversity in each Project and cannot be standardized. The data Table design is very important and these must be carefully planned and created for easier retrieval of information as well as to avoid duplication. Proper relationships must be established between Tables to join related information together. Ignoring the importance of these considerations, designing with casual approach and filling up data in them like you do in Microsoft Excel will land you in trouble when you attempt to prepare reports out of them. You can see a good example of database design in the C:\Program Files\Microsoft Office11\Samples\Northwind.mdb sample Database. Open this sample database and select Relationships from Tools Menu to view the structure of various Tables and how they are organized and related one another. Use it as a reference point and guide when you plan for a new Project. Each Field Name in bold is defined as Primary Key in their respective Table and established One-to-many Relationships to one another. This will ensure the availability of required information when needed from related tables for Reports. The above lines were only a reminder to your future projects. You can see an example image of a bad Table design below. The Location names and Description values should have been in Tables of their own with appropriate Codes. 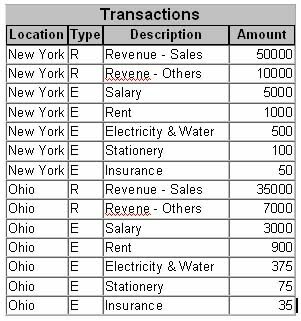 Two Combo Boxes can be created in the Transactions Table Structure to insert those Codes into the fields to avoid duplication of information as shown below. But here, we are going to concentrate on learning the data processing steps using the above Table. The second data field Type contains transaction type Codes. R stands for Revenue and E for Expenses. These category Codes are introduced in the Table keeping in mind that we must be able to Group the transactions on Category and Tabulate the Revenue and Expenses Values separately. The Description field shows the actual Account Heads under which each transaction is recorded. The first thought in your mind, I presume may be, how you can subtract the value of one Row from the other. Then you are thinking on the right direction. If you say in four steps I will not accept that as a good approach but if you can solve the problem and come out with the result then that is OK with me. After all, the correct end-result is all that matters as far as the User is concerned. If you say in three steps I will be happy to see you how you do it. If you say in two steps then I know you have some grip on things around here. If you say in one step then I know you are somebody with MS-Access. If you are really interested in taking up this simple challenge then stop reading further down from here and start trying out this in a database of your own. Come back with your own solution and compare it on the examples given here. If you do it differently, but arrived at the same result then share that idea with me too. Create the Transactions Table with the Structure and sample data given above. Copy the following SQL String into the SQL Editing Window of a new Query and save it with a name you prefer. Open the Query in Normal View and you will see the result of the Query as shown in the second Image given above. 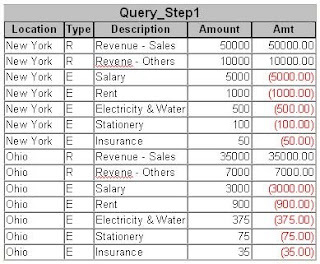 Create a Query with the following SQL String and name the Query as Query_Step1. Tip: The Query Amt Column is formatted to display Negative Values in Color and in brackets. Open the Query in Design View. Highlight the Column and click on the Properties Toolbar Button or select Properties from View Menu to display the Property Sheet of the Column. Type 0.00;[Red](0.00);0.00;0.00 into the Format Property and save the Query. If you open the Query now the output will appear in color. The Format Property Values are expressed in four segments separated with semi-colons. First segment dictates how to display positive values, second segment stands for Negative values, third segment says what to display when the field value is Zero and fourth segment displays zero when the Field/Column contain Null. Third and fourth segments can be set with a literal string like 0.00;[Red](0.00);"Zero";"Null" to display these values rather than 0.00. You can set the Field Format Property values on the Table Structure, on Forms or on Reports. It is not necessary that you should use all the four segments of the Format Property Values all the time. 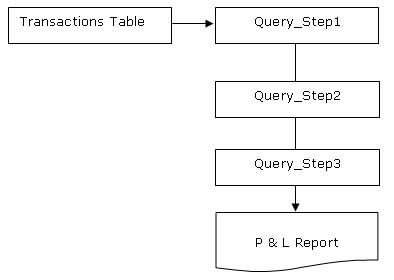 Open the PL_Report Query in normal view and the result will be same as the second image given above. If you need more clarity in how the results are being formed for the final report then try this method. 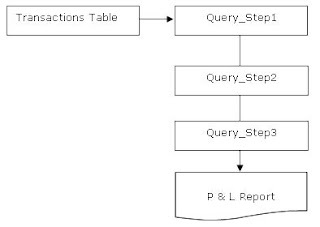 You can use the first Query under the two steps solution as the first step here. The output of the second Query is given below. 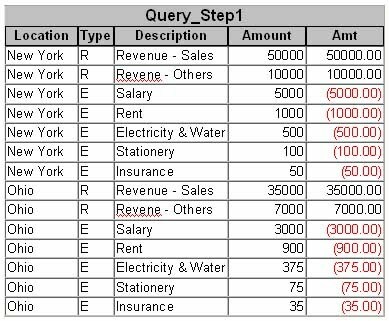 The output of the above Query is given below with a three Column result replacing Type Column with Description. How about doing it differently and arrive at the following Result with Queries in two Steps? Open Method2_2 Query in Normal View and check the output. As you have seen in the above examples you can approach a problem in MS-Access differently and arrive at the same result. If you have to create several steps to get the final Report output, then it is a good idea to create a Flow Chart of the Process Steps. Later on if you find something is not right with the Report you can always follow this path and back-track to find the Error. If the Transactions Table has Year and Month Fields too and both locations have January and February 2009 data in them then how you will create the Report Month-wise? Try it out on your own and check it out with my examples next week. Sample image of the output is given below for reference. Hi, I had a few minutes to kill so I gave this test a go. I did this in two steps but used a different method to you. Here is what I did. Firstly, my table is called tbl_test but the field names are the same. Please Check the image that I have given as output above and compare it with your Query result. Yes, I accept your example as a solution with a difference to the earlier challenge that I have given at the beginning part of this Article. I am glad that you have shown the courage and tried to approach the problem to solve it. We need little re-thinking here. If we follow this pattern of creating Queries for each month and linking them together one by one we will be creating Queries through out the Year after introduction of new Data into the Table each month. But, you are in the right direction, little bit of planning is required. I will give you a clue. We need only two Queries to solve this problem. Well I was just duplicating your example. Of course if I were doing this month on month, then the location would be transposed...therefore.. This way you can add as many months as you want, though if a new location were brought in, you'd need to create a separate query for each new location. Even though we have used only two locations in the example; there can be several locations in the Report. Creating Queries for each location is very complicated. It is not that hard to create this Report. With the right approach we can do this with few steps. I am getting ready with the next Article on this. I will come out with my solution to this problem tomorrow late evening. Visit the site tomorrow late at night (Oman Time, +4 GMT)or day after tomorrow. You can subscribe to the RSS Feed by entering your E-Mail Address in the right-side panel above. You will receive the Article as soon as it is published Online.